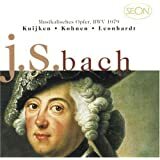 Bach's Musical Offering is One of the Most Unique Chamber Works Ever Written. For Instance Instead of a Fixed Ensemble, in Each Movement the Instrumentation Varies from a Lone Soloist to Combinations of Two to Four Musicians. As One of the Very Few Ensembles to Record all of J.s. 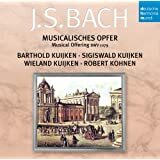 Bach's Chamber Music the Musica Antiqua Koln Here Offer One of the Finest, Most Idiomatically Knowing, Crisply Articulated and Spirited Performances of the Work Available. Archiv's Sound as Well is Top Notch with Remarkable Acoustic Clarity and Definition. There are numerous versions of the Musikalisches Opfer BWV 1079, for solo harpsichord or piano, small ensemble, or small orchestra. 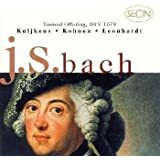 Each version brings a different character of Bach's work. This version is for a small ensemble (6 musicians). 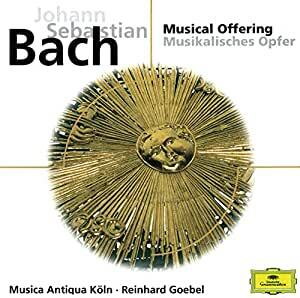 I find this to be an excellent presentation of this deeply contemplative, very late work of Bach's. They deliver a very thoughtful and intellectual performance. This performance is more intimate than the orchestral version by the Stuttgarter Kammerorchester (q.v.). 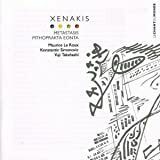 The sound is magnificent in this recording and the cerebral nature of the work is mitigated by the intimacy and color of the various instruments. I have always liked the Musical Offering. That said, many people don't, finding it dry or "academic". If you fall into that category, this recording may change your mind. The playing is lively and most importantly, it focuses one's attention to the composition and interplay of the voices. I own four different versions of this work, and this recording is my favorite. Check it out!